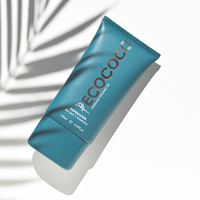 The ECOCOCO Sea Salt & Charcoal Face Exfoliator is part of the brands skincare collection which combines a range of nature’s most potent, skin loving ingredients in a 3-step regime – a performance-based range of all natural and Certified Organic ingredients to cleanse, exfoliate and moisturise. ECOCOCO’s Sea Salt & Charcoal Face Exfoliator contains active ingredients to provide an invigorating and intense treatment to reveal a fresh, glowing and flawless complexion. Formulated with the ultimate combination of Maris Sal (Sea Salt) and Charcoal to polish the skin and tighten pores whist also preparing the skin for better absorption of the ECOCOCO Face Moisturiser. Use as a treatment twice per week for optimal results. Ideal for all skin types especially acne and congested skin to assist with unclogging pores.